Maine has nine snow tubing parks located across the state. Winter in Maine is all about the snow. In times past the wooden sled would come out and the pilgrimage to the highest hill in town began. Once on top of that hill, one or more would pile onto that sled for the fast, usually bouncy ride to the bottom. Then it was back up to the top to do it all over again. Ah, the energy of youth. People in Maine still take to neighborhood hills to go sledding, tobogganing and whiz down the slopes on colorful donut shaped tubes. Maine’s sledding and snow tubing parks are a delightful alternative. No one really knows when the first human picked up something flat and decided to slide down a hill. Centuries ago the ancient Hawaiians built “holua sleds” and challenged each other to race down a leaf or cinder covered slope. Modern sledding got its start in St Moritz in the mid 1800s. British visitors, with nothing but time on their hands, borrowed delivery sleds and started zooming down hills. Later came the creation of toboggans, sleds specifically crafted for the sport that you could actually steer, sort of. On the North American side of the Atlantic, sledding was also catching on. Paris Manufacturing (pariconsleds.com) in South Paris, Maine has been making sleds since 1861. They patented the brand Flexible Flyer, still in use today. The original sleds were made of wood and hand painted with snow scenes and scroll work. Finding one of these antique beauties today is a rarity, but you just might get lucky in a local antique shop. Today Paris Manufacturing makes sleds and other winter toys out of wood and lightweight plastics. Some have steel runners, making them super fast. The company also makes foam sliders and inflatable tubes, both handy for barrelling down a snow covered hill. The Camden Toboggan Company (camdentobogganco.com) opened its doors in 1992. Producing roughly 40 to 50 handmade wooden sleds per season, the smallish firm has a nationwide following. Nearby is the Camden Snow Bowl (camdensnowbowl.com), the local ski-snowboard-tobogganing playground that served as their inspiration. The Jack Williams Toboggan Chute offers thrills and yes, sometimes spills, on a 400-foot long ride down a frozen, luge-like ice chute. The U.S. National Tobogganing Championships are held at Camden each February. The Camden Snow Bowl’s winter season runs from December to April, weather permitting. The toboggan run is open Friday and Saturday from 5 pm to 9 pm, at a cost of $10 per session. Rentals of toboggans are also available. 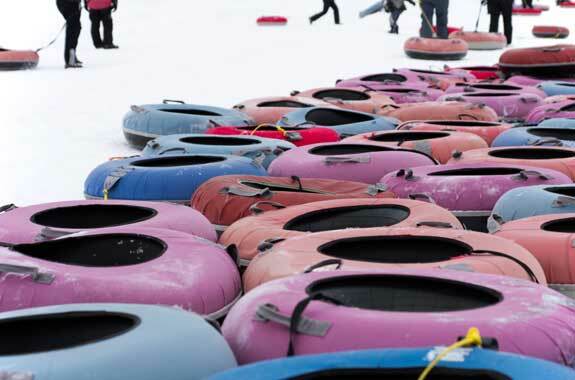 Tubing also dates back to the 1800s, at least for the snow variety. Water tubing got a somewhat later start, beginning in the mid 20th century in Thailand. Similar to sledding, tubes are more difficult to control because of their lighter weight and donut shape. Dragging your arms in the snow can slow down a sled, but it only makes a tube spin. The safest place to tube is in a tubing park where the runs are kept clear of trees and other obstacles you don’t want to run into. Maine has a number of tubing parks where you can take that thrilling ride down the hill and not worry about running into that stray tree or boulder. Most tubing parks have height and/or age restrictions and some require you to sign a release. Located in the Sebago Lakes Region, Seacoast Fun Park (seacoastfunparks.com) is a year-round playground that offers 12 snow tubing lanes during the winter season. An Express lift takes you and your tube to the top of the runs, then it’s a quick thrill ride down. Repeat for more fun. The park makes artificial snow to compensate if Mother Nature doesn’t cooperate. Seacoast offers an arcade and the onsite Goodies Café. Winter season runs from the end of December until mid-March, weather permitting. The tube runs are open Friday, Saturday, Sunday and during school holidays. Schedule varies with the days, but night tubing is available until 9 pm most Friday and Saturdays. Tickets average $17 to $26, depending on age and if tubing solo. How could you not love a place where the concession stand is called Belly Busters? Oxford Plains Snow Tubing (oxfordplains.com) offers maintained tubing runs with a lift and a warming shack to keep you cozy between runs. Helmets and tubes are provided. The season runs from the end of December until mid-March and Oxford does make its own snow. Tube runs are open Saturday and Sunday and all week during school holidays. Night tubing is available until 9 pm most days. Rates run from $12 for a one-hour ticket to $20 for an all day pass. Oxford is located on Route 26 near the speedway. Located five miles outside of Bethel, Mt Abram (mtabram.com) is an all round family winter resort that boasts the longest tube run in the state, 1,325 feet. Black Mountain (skiblackmountain.org) in Rumford offers its Edge Tubing Park with tickets running from $10 for a half day session to $16 for all day use. Riders must bring their own tubes. Big Rock Ski Resort (bigrockmaine.com) at Mars Hill, Sugarloaf (sugarloaf.com) in the Carrabassett Valley and Hermon Mountain (skihermonmountain.com) in Hermon are three other ski resorts that offer tubing hills. The White Cap Fun Center at Sunday River (sundayriver.com) offers tubing on the Sundance trail located on the South Ridge. Tubers take the Magic Carpet lift up the hill, jump on the colorful giant donuts and take that cheek-reddening ride to the bottom. The run is only open Friday and Saturday from 5 pm to 9 pm, but the tickets only run $10 per session. The Camden Snow Bowl, as mentioned above, also offers snow tubing. 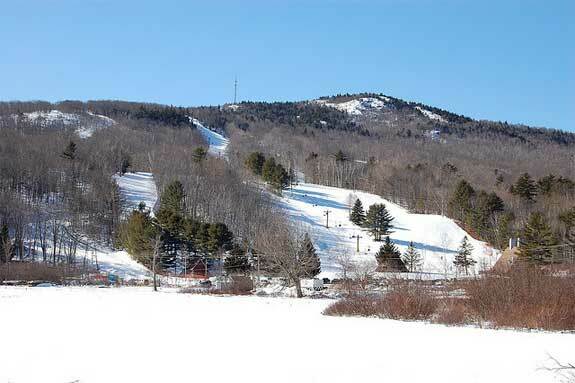 Camden Snow Bowl, in Camden, Maine, offers a tubing hill and toboggan chute.